The latest word from Stefanie Alsdorf at Dahm International is that the price of Herbert Dahm's central agency for sale, Jongert's 30m sailing yacht Black Molly III has been reduced in price by a keen seller. Built in 1998 and refitted in 2006, the sailing yacht's Peter Sjim interior provides space for six guests in a master and two twins, plus separate accommodation for four crew. 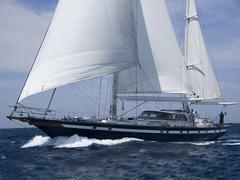 Her berth in Palma de Mallorca is also for sale and Black Molly III is now asking €3.5 million, a price cut of €450,000.